To investigate clinical feasibility, technical success and toxicity of 166Ho-radioembolization (166Ho-RE) as new approach for treatment of hepatocellular carcinomas (HCC) and to assess postinterventional calculation of exact dosimetry through quantitative analysis of MR images. From March 2017 to April 2018, nine patients suffering from HCC were treated with 166Ho-RE. To calculate mean doses on healthy liver/tumor tissue, MR was performed within the first day after treatment. 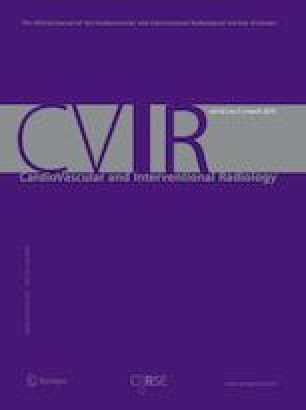 For evaluation of hepatotoxicity and to rule out radioembolization-induced liver disease (REILD), the Model for End-Stage Liver Disease (MELD) Score, the Common Terminology Criteria for Adverse Events and specific laboratory parameters were used 1-day pre- and posttreatment and after 60 days. After 6 months, MR/CT follow-up was performed. In five patients the right liver lobe, in one patient the left liver lobe and in three patients both liver lobes were treated. Median administered activity was 3.7 GBq (range 1.7–5.9 GBq). Median dose on healthy liver tissue was 41 Gy (21–55 Gy) and on tumor tissue 112 Gy (61–172 Gy). Four patients suffered from mild postradioembolization syndrome. No significant differences in median MELD-Score were observed pre-, posttherapeutic and 60 days after 166Ho-RE. No deterioration of liver function and no indicators of REILD were observed. One patient showed a complete response, four a partial response, three a stable disease and one a progressive disease at the 6 months follow-up. 166Ho-RE seems to be a feasible and safe treatment option with no significant hepatotoxicity for treatment of HCC. R.-T. Hoffmann participates as proctor, advisory board member and received speaker’s honoraria from Sirtex and Terumo. The other authors declare no conflict of interest. All procedures performed in studies involving human participants were in accordance with the ethical standards of the institutional research committee and with the 1964 Helsinki declaration and its later amendments or comparable ethical standards. This study was approved by local ethics committee. In addition, it is a retrospective study, and for this type of study, formal consent is not required.